Our last stop on our Cambodia Tour was the nice little town called Battambang in north western Cambodia. 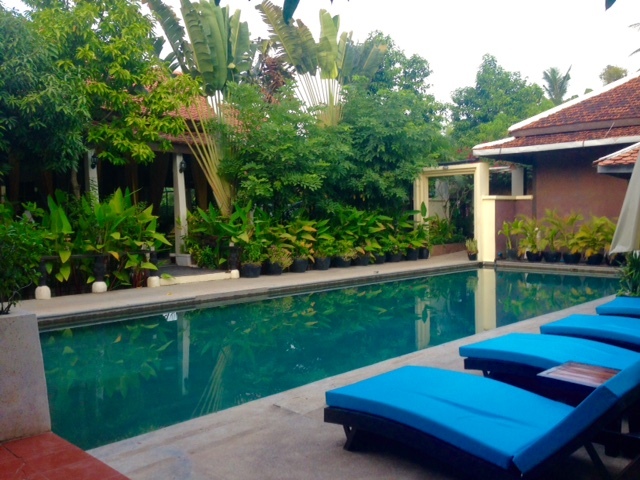 We stayed at The Sanctuary Villa Battambang for 2 nights before we headed to Bangkok. This amazing hotel looks a little like a Khmer Buddhist Temple, which is very nice and makes difference . All the rooms a beautiful villas with a terrace. 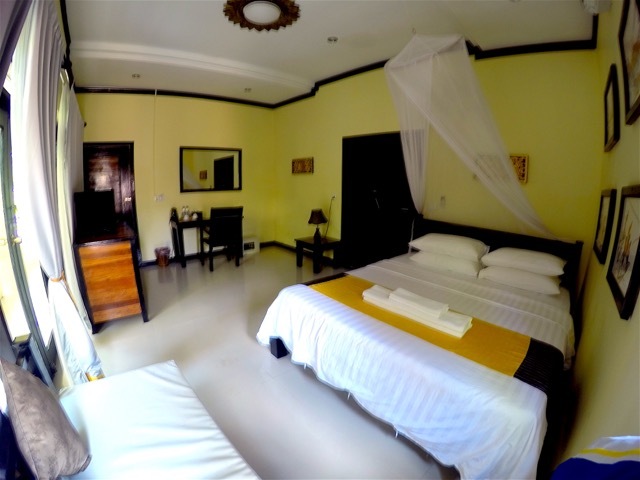 The black furnished rooms look very elegant and we felt very comfortable there. It is great to have a lot of space in a hotel room. The bathroom was amazing, additional to the walk-in shower, our villa had a jacuzzi too. 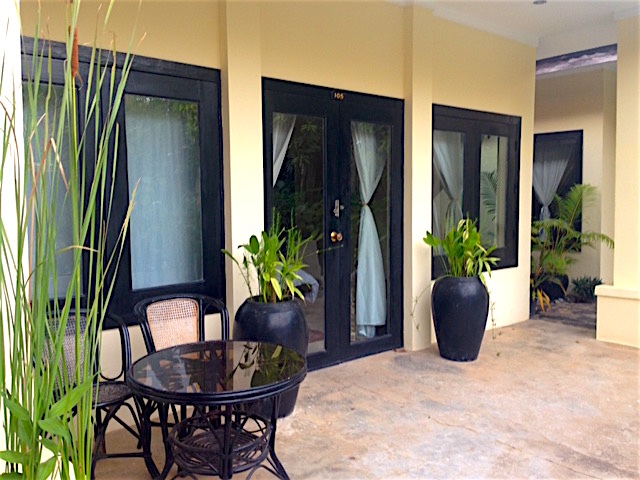 Every villa has a flatscreen tv and a dvd player as well. The weather was sunny and we could enjoy our time at the nice salt-water pool. The comfortable relax chairs are perfect to read or chill and get a tan. I loved the nice trees and flowers around the pool. We saw a lot of butterflies. The Sanctuary Villa Battambang has a great kitchen. The breakfast buffet at the outside restaurant was very tasty! 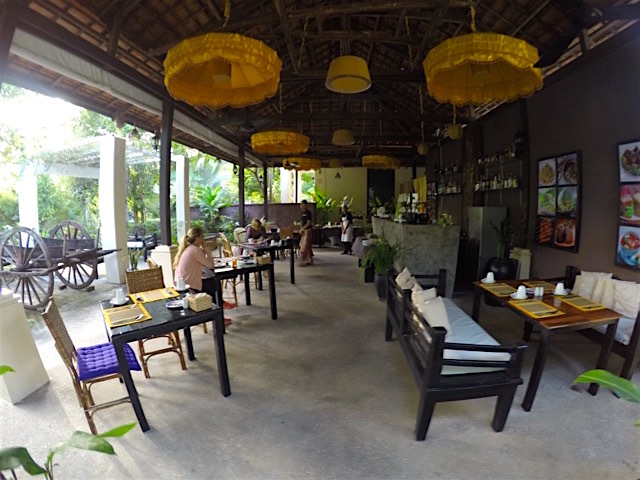 They offered khmer dishes, western breakfast and fresh fruits with coffee, tea and different juices. We also had a delicious lunch there. The table is set up very graceful. Before the main dish, the staff served us fresh and warm bread with butter. 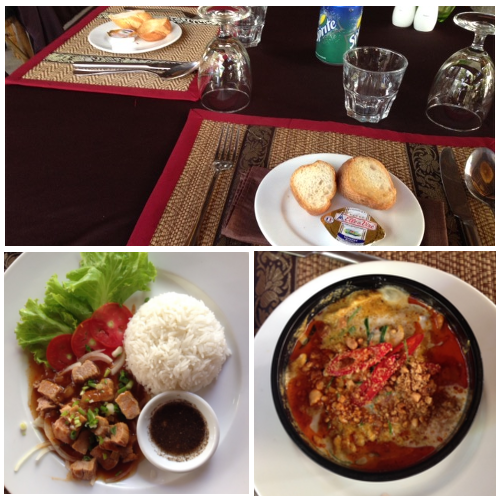 They made perfect khmer dishes, like the famous beef lok lak and chicken amok. I tried my first chicken amok there and i loooved it! It came in a little baking dish with a lid and was served very nice. The staff of the hotel is very friendly and helped us planning our next bus trip to Bangkok. Whenever you want to go to the city center, which is about 5 minutes away by tuktuk, they call a tuktuk for you and take care of every matter.